Happy Lunar New Year! We love our quirky company culture and having a team that gives back. 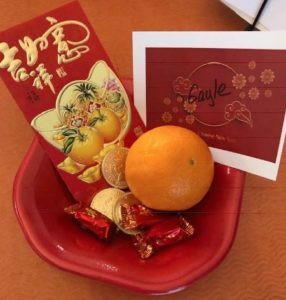 Tom, our Operations Manager, sent out a company card to celebrate the Chinese New Year and left some sweet treats on every employee’s desk. Tom’s gifts were very meaningful and symbolic of the holiday. He included a red envelope, in the Chinese tradition of giving. Inside the envelope was $8 – which is a Chinese lucky number. Tom also included an orange (a symbol for prosperity), good luck candy, and chocolate gold coins to start the new year on a sweet note. Enjoying reunion dinner with family. Sharing red envelopes and gifts. There are many public celebrations and traditional performances (such as the commonly seen dragon dance). Symbolically, there are many things individuals can do to promote luck in the coming year, including eating lucky foods, sharing gifts and lighting firecrackers (to scare away any evil). The pig is the 12th and last cycle in the Chinese zodiac. The pig is a sign of wealth and good fortunes. Other years of the pig include; 1935, 1947, 1959, 1971, 1983,1995, 2007 and 2019. Lucky numbers for pigs are 2,5 and 8. Lucky colors for pigs are yellow, grey and brown. How are you celebrating the Chinese New Year? Share with us on social @LTronCorp. The L-Tron team would like to extend a happy new year to all of our customers, family & friends. We are wishing you health, wealth and good fortune in the coming year. Questions? Interested in learning more about the Chinese New Year & our culture of giving?